We are all leaders. 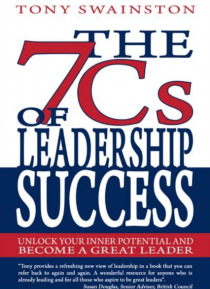 And "e;The 7 Cs of Leadership Success"e; gives us the strategies to enable us to become great leaders. Wherever you are in your journey as a leader, this book will provide you with secrets that will single you out from other leaders around you. The 7 Cs reveals:*the thinking of great leaders*the beliefs of great leaders*the habits of great leaders*the attitudes of great… leaders*the expectations of great leaders*the actions of great leadersIt also enables you to adopt the same thinking, beliefs, habits, attitudes, expectations and actions of truly successful leaders. With the 7 Cs you can become the kind of outstanding leader that you want to be. The 7 Cs will enable you to approach leadership challenges that you face in a calm and effective manner. As a result you will be able to remove stress and replace this with positive energy that will help you to achieve your goals. Time that you might have previously spent worrying will then be spent in helping you to stride towards your vision. You can use the 7 Cs as a user-friendly guide that will support the growth of your confidence and happiness in all that you do. The 7 Cs is a very practical resource that shifts the theory of effective leadership into the practice of leadership success.